A lifelong leader in the world of museums, John Hightower directed major institutions such as New York’s Museum of Modern Art and South Street Seaport, but also led smaller efforts such as Norwalk’s Maritime Aquarium, which he helped to establish. Born in Atlanta, Ga. in 1933, John Brantley Hightower grew up in New York City, graduated from Yale University in 1955, and served two years in the U.S. Marine Corps. In May 1970 he was named director of the Museum of Modern Art. It was during a time when the Vietnam War had spawned an age of public protests across the nation, and he led museum for a turbulent year and a half during which MOMA was the site for demonstrations and “guerilla art actions” on topics that ranged from layoffs of museum staff to the number of new artists exhibited, and even the bombing of Cambodia. Dismissed at the age of 37 amid what was called a “highly charged political atmosphere,” he continued to work in culture and the arts. He served as president of the South Street Seaport Museum in Manhattan in the late 70s, converting “a shabby remnant of New York’s waterfront into one of the city’s most popular tourist destinations,” according to The Times. He and his wife, Marty, came to Ridgefield in 1983; they had homes at first on High Ridge and later on Main Street. Shortly after they arrived, he became executive director of the Maritime Center in Norwalk, and led its transition into the $30-million Maritime Aquarium with a museum, aquarium and IMAX theater. In 1988, he moved south and oversaw arts planning and development for the University of Virginia. In 1993 he became director of The Mariners’ Museum in Newport News, Va. 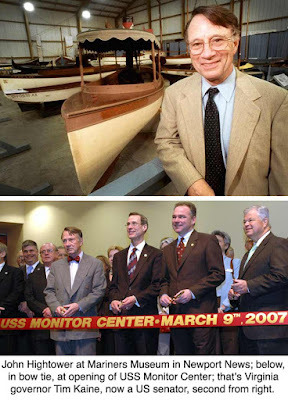 There he led the creation of The USS Monitor Center and Conservation Laboratory, preserving remnants and honoring the memory of the Civil War “ironclad” gunboat. When he arrived, the museum had literally a few pounds of Monitor artifacts; when he retired in 2006, it had 210 tons of Monitor material brought up from the floor of the Atlantic. He also “guided the transformation of The Mariners’ Museum into an institution that tells the sweeping stories of man and the sea,” according to an obituary in The Daily Press of Newport News. He retired in 2006, but remained active in the cultural world of southeastern Virginia, serving with several organizations. “John was a Renaissance man,” said Mariners’ Museum board chairman John Lawson. Mr. Hightower died in 2013 at the age of 80.